“THIS IS NOT A GOOD IDEA,” said Honey. “You’ve had an incredibly lucky escape on Mogadosabron, Jive. And here we go again, jumping straight into danger. We’ve got an important consignment of rare antiquities aboard and just can’t afford the risk. Fromway made no reply as he flicked for pilot manual. He jabbed the warp-drive cut-out and there was a strange shifting sensation as the continuous streaks of light on either side of the freighter wavered, then blipped out and became motionless stars. The Lucindra Leo dropped out of warp and idled in impulse. Ahead of the ship, a gigantic misty veil of interstellar gas stretched right across space for almost a score of light years on either side – like some endless gigantic wall. But there was a great gaping oval-shaped hole in the middle. This vast cloud of gas is the Rumhafort Nebula and the oval-shaped hole in its middle, which could swallow several star systems, is the Rumhafort Gap. The Rumhafort Gap contains a binary system with gas giants and their satellites – and the biggest and best service station this side of the Dargon Deep. The Dargon Deep is a huge black globular nebula stretching out beyond the Gap. Everyone wants to visit the Gap Service Station but no one wants to cross the Dargon Deep, for it is the hideout of space pirates To travel beyond the Gap, you have to detour round either side of the Rumhafort Nebula, which circles the Dargon Deep like a snaking girdle of pink and purple haze. Seen from afar, the Rumhafort Gap is like a peephole through the haze to the depths of the Dargon Deep – and with the stars of the Barolla-Bhepang binary system shining brightly at its centre, it resembles a staring eye peering out. It reminds everyone of the space pirates, watching out for approaching victims. Fromway stepped up the cruise rate to half-impulse. Fromway yawned and stretched, then winced and carefully touched the tender place between neck and shoulder, where the vampire on Mogadosabron had tried to drain his life recently and nearly succeeded. It was all due to that chambermaid coming in without knocking first, that he was saved, he thought gratefully. He shuddered at the memory of her hysterical screams, breaking him out of his hypnotic trance to find some dreadful creature that he’d thought was a beautiful woman only moments earlier, slowly sucking the blood from his neck. In his mind, Fromway could still hear those piercing screams and see the look of utter horror on the chambermaid’s face – still feel the ice-cold, clammy touch of the creature’s hands upon him, and the warm, almost numb sensation at his neck – and that awful sibilant slurping sound, so close to his ears. He’d lost near to a pint of blood before the outcry sent the creature scuttling. Good thing he’d left the door unlocked, Fromway thought, otherwise he mightn’t be alive now. Grok’s unholy horrors! He shuddered again. She saved my life – Lucy! Which coincidentally is also short for Lucindra, the name of my freighter. I’ll send her a message of thanks and some flowers or something. Now, where can I get flowers out here – Gap Station? Creepy being bitten by some thing you thought was a beautiful woman – had to have shots for a dozen different diseases afterwards. Fromway got up from the pilot seat shakily and made his way to the galley, dialling a meal and drink, and then retired to his cabin. When he returned to his pilot seat nine hours later, the Barolla-Bhepang binary system was on screen and less than an hour away at half-impulse. The Lucindra had already passed through the cloud of dust and debris and the thousands of asteroids that ringed the outer fringes of the huge binary system. These were the Doobee asteroids, mined for Guazanite by the Doobee Mining Company – where Fromway had a brush with the Dargon pirates earlier in his hazardous career. The Doobee Mining Company had since formed a business alliance with Gap Station’s Security Division, with their asteroid belt now patrolled by Gap security cruisers. Fromway saw several huge cruisers prowling around. “The chambermaid screamed so loud that nearly everyone in the guesthouse came running. They called the police and then the ambulance service. It seems your attacker fled through the back garden in all the confusion. Somehow, in all the proceedings, a reporter must have got wind of it all – and you know what they’re like!” Fromway collapsed back into his seat again. “Frank says the authorities ought to issue public warnings to newcomers,” Honey said. “But they’re too afraid of losing the city’s lucrative high turnover in tourist trade. Apparently, the authorities consider the likelihood of attacks by predatory indigenous life-forms a very remote possibility and regard any alleged incidents involving vampires as nothing more than wild gossip and the raving speculations of local superstition. “Please enlighten me, Jive?” Fromway spread his hands. “Identify yourself now.” A fuzzy, metallic-sounding monotone spoke sharply. A hairless humanoid, all shiny and golden with pinpoint eyes and no ears revealed itself on screen. Its features were so utterly motionless and perfectly symmetrical that Fromway realized instantly that it was some kind of antique robot or android confronting him. “Insert ID chip in send-channel – transmit immediately on frequency now appearing on screen.” The humanoid face blipped off-screen. Fromway slipped his ID chip in the send slot, sending it off to the coordinates now appearing on screen alone. There hadn’t been this rigmarole with impudent bots last time he was out here. But then Fromway hadn’t gone through the usual channels. Surrounded by Gap-Security cruisers and fleeing from the Dargon pirates, he’d been escorted to the Gap station for repairs to several ruptured hull plates, and thence, to a safe departure point around one side of the Rumhafort Gap’s great nebulous veil. Fromway recalled his commission for the Doobee Mining Company; how he’d flown in to pick up a consignment of Guazanite from the asteroid belt, only to find the Dargon pirates were after it. He’d landed on one of the asteroids and had finished winching the crates up into the Lucindra just as the pirates were touching down. A phaser beam shot out from one of the pirate vessels scoring a broadside on the Lucindra’s starboard hull and rupturing several plates. 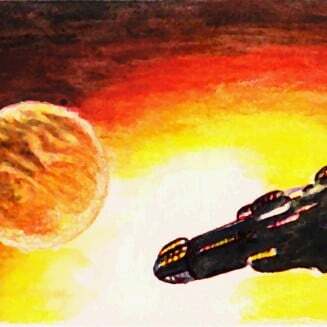 Fromway launched into space with his shielding activated and the pirates in pursuit – not that his shielding would hold up for long under constant heavy armament attack. Those security cruisers had certainly scared off the goddamn pirates; they all turned tail without a single phaser beam fired in return. They never had the chance. The security cruisers came streaking out of nowhere like Grok’s own sweet avengers, with phasers blasting as if they’d just shot out of warp or were lying in wait nearby within a cloaked device. The cruisers scored two direct hits that flared up like novas, and winged and crippled four other vessels before the pirates managed to make their escape. They were big, powerful and heavily armed and well shielded; they were twice as large and there were twice as many of them as there were pirates. That was the first time the Doobee Mining Company had requested help from the Rumhafort Gap Security Services. It was the first time they’d had problems with the Dargon pirates. It must have cost them a packet. Fromway didn’t kid himself the Doobee Mining Company had splashed out purely for his own protection; their valuable consignment was obviously their first priority. It had cost him to have his starboard hull plates replaced, as well. Next time someone wants him to pick up a consignment, Fromway vowed; he’d take Honey’s good advice and make sure it was safe to do so, or ask the client to hand it to him personally. The Lucindra entered the Barolla-Bhepang system. The two stars shone up ahead: Barolla, the mother – a blue-white giant, and Bhepang, the daughter – a yellow dwarf, circling her mother at a respectable distance. And around Bhepang the daughter revolved all her daughters, the gas giants with their dependent satellites and outermost, the asteroids of the Doobee Mining Company and the dust and debris of rock and ice stretching out like some vast attenuated shell around her. Four generations of cosmic matter, all in a perpetual dance of perfectly synchronized, harmonic motion. “When are these friggin’ chuggers gonna get back to me?” growled Fromway as the Lucindra passed the outermost gas giant; a squashed, fuzzy orange ball, with a smoky-green disc of a ring circling it at an acute sixty-degree angle. A bloated human face appeared on screen, oily and deeply coloured like a ripened damson, as though born native to very tropical climes. Mournful black orbs stared out from the clear whites of heavy-lidded eyes and an enormous pale blue beard and curled moustaches jutted spade-like from the swelled pouches of his cheeks. A huge white beehive of a turban sat upon his head. “Gap Serfices responding,” he said in a singsong voice. I can’t believe this! Fromway was both flabbergasted and amused. The screen went blank. After a few moments, it swirled with fuzzy multicoloured static for a while and then another face abruptly snapped into sharp focus. This one was cadaverous and leathery. The bony jaw line was bereft of the slightest shadow of whisker and the skin a deathly pale grey. Feathery, pink, quill-like appendages sprouted out either side of angular cheekbones – and stiff blue wattles lined the lower jaw. A blue-tinged glare flickered down in searing bursts from somewhere out of sight and a blurry background of monstrous shadowy shapes moved constantly behind the being’s incredibly wide, arching shoulders. A muted, echoing concordance of trillings, buzzings, banging’s, clankings and raised voices gave the impression of some vast cathedral-like workshop. Beneath the peak of a helmet, beady eyes gazed unwinkingly through tinted goggles. Beneath the eyes, a great shiny grey hawk-like beak jutted forward, enclosing a wide curving line of mouth and tiny slitted nostrils. “No problem,” said the avian, holding up a clipboard in a clawed hand and looking at it. “We’ve done those before. “Captain Jivelan Fromway.” The avian turned his attention to one side of the screen while a clawed hand reached down and out of sight in sharp jabbing movements. Fromway nodded as the avian looked up at him. “How long will a full-service take?” he said. The avian turned his head studying something out of sight again and then picked up his clipboard, making notes on it. The avian looked up from his clipboard. “Traffic Control will be in touch with you shortly, sir.” The screen blanked out again. More fuzzy static swirled about for a while. “Traffic Control,” said a voice in crisp, military tones almost before the image appeared. It was a stern-faced human with a lantern jaw and an ornate waxed moustache. Penetrating dark eyes looked out beneath bushy dark brows that matched the man’s moustache. Some sort of dark tunic buttoned right up to his neck and a headset with earphones sat across his sleeked-back grey hair. “Fine,” said Fromway, nodding. The screen blanked out again and a set of coordinates appeared. Gap Station was a world-sized object – a vast artificial edifice built upon and tunnelling deep into a very large asteroid – an irregular ovoid bristling with crater-like apertures and embossed with domes and turrets. A mere one thousand kilometres to one side of Gap Station hovered Murmos, a huge jovian-sized green and blue striped gas giant, dominating half the sky. The sunlight of Bhepang shone full on the face of Murmos, reflecting in green beams on the starboard side of Gap Station. On the port side of Gap station, electric lights blazed in the night shadow of Jingibroth, a reddish-coloured satellite of Murmos larger than Earth’s Moon. Sandwiched between Murmos and Jingibroth and surrounded by patrolling surveillance satellites and armament-platforms, and with squadrons of manned battle cruisers ready for action within other hollowed out asteroids nearby, the self-contained world of Gap Station was well defended. Honey led the Lucindra in on the provided guidance-beam to a landing bay. “Hang on, Honey, I’m coming out.” Fromway emerged from the galley with a steaming mug in one hand and a sandwich in the other and took his pilot seat. “Yup, call the service bay now, Honey.” He put his mug and sandwich down and leaned back in his seat, staring at the main screen waiting. “Service bay,” said a fuzzy dark voice, with a face to match. Four round, glistening black eyes looked out from a huge black furry head at Fromway. “Tchixtthra speaking. Zir, can I help?” Beneath the eyes, black curving pincers opened and shut as the being spoke. “The Lucindra is docked and waiting for servicing,” said Fromway. “Someone called Kwatzaqatal took the order.” A black spindly limb covered with bristles and barbs came into view and jerked about on something below screen level, while facial pincers opened and shut with clicking noises. “CSD?” Fromway picked up his mug and sipped from it. “Glad to hear it,” said Fromway, picking up his sandwich and biting into it. Fuzzy static swirled again as he deactivated the screen. With a shoulder bag full of essentials and the matrix, phone, some cash, chips and cards in his pockets, Fromway stood on the docking platform outside the Lucy, waiting in the cavernous reaches of the landing bay. A yellow vehicle hummed in through a dilating spiral door to one side and pulled up by Fromway’s platform. A tall human male with blond hair and very blue eyes and dressed in a smart pale-blue suit stepped out and ushered Fromway to the seat beside him. “Captain Fromway,” he said, smiling pleasantly, “I’m Sting Starlight. I’ll be escorting you to Client Services. I take it you have your necessary requirements with you?” Fromway nodded and indicated his shoulder bag. Sting Starlight? Surely that’s not his real name, he’s got to be jerking me off. He stepped down into the passenger seat as a huge towing conveyance chugged in through a wide entranceway to haul the Lucindra to service bay. They entered a wide, well-lit tunnel and drove along the right-hand side of a dual carriageway. “We have everything you need here,” said Starlight as the vehicle suddenly emerged on the surface of the asteroid. Fromway nodded and cleared his throat. Starlight threw back his head and laughed, showing perfect white teeth. The dual carriageway now ran beneath a transparent cover that arched above them with Murmos hovering in the sky to the left like a huge rounded green hill looming over the horizon. Starlight waved his hand to the right but Jingibroth was well out of sight below the horizon on the far side of the asteroid and Bhepang hung low in the sky, shining like a bright coin. The covered carriageway began sloping uphill. “We generate enough power from various natural resources for continual use and reserve storage,” said Starlight as they reached the top of the rise and started descending towards a huddle of large transparent domes. They entered the first dome and emerged in a wide, four-lane thoroughfare lined with trees and flowerbeds at either side and low-slung buildings further back. It looked like a summer’s day with the sunlight of Bhepang shining in, and through the atmosphere of the dome the sky appeared deep blue. Starlight pulled in to a lay-by behind the trees and flowerbeds and stopped the vehicle at the transparent-fronted entrance to a large reception lobby. “I leave you here, Captain Fromway. They’ll answer your queries and provide you with all your needs inside. Just go up to the reception desk and show them this.” Starlight handed over a pink plastic card as Fromway got out of the vehicle. “I bid you good day and wish you a pleasant stay.” He drove off waving cheerily. Inside the reception was a spattering of various individuals seated on padded sofas and armchairs and at the far end, behind a wide, curving reception desk, a very motley selection of beings. They were gazing down at screens in front of them, talking on hand phones or engaged in conversation with someone the other side of the counter. Fromway walked up and stood a couple of metres before the counter with his pink card held in both hands in front of him, eyeing the assortment of humans, humanoids and other beings on the other side, waiting for one of them to notice him. Several of them did, eyeing or ignoring him in their various inscrutable ways, but only one of them spoke to him, a pretty little tawny felinoid with huge startling green eyes, long black lashes and a tiny mouth and nose. It was an utterly captivating visage. “Can I help you, sir?” Her voice was soft and melodious and her figure curved attractively beneath the silky green and blue uniform. “I do hope so,” said Fromway. He handed over his pink card, which the felinoid passed through a scanner and handed back to him. She studied the screen in front of her. Then she pushed a button with a delicate long-nailed finger and a small blue plastic booklet emerged from a slot. She handed it to Fromway with a dazzling smile. She opened the booklet, pressed the inside front cover with a fingertip and it lit up with text. She pressed it again and the text scrolled down. “This is the index. Press any item and all the information on it appears on the facing screen.” Fromway saw that it was not a booklet but a case with two little video screens on the inside of the covers. The felinoid pressed several indexed items in succession and maps and moving pictures appeared on the other screen accompanied by text and vocal narrative. “Almighty Griff! Just the thing,” said Fromway, looking through the index, pressing items at random and viewing the information displayed. “How long are you here for?” said the felinoid. “Really! How kind.” Fromway smiled at the felinoid across the desk and she smiled back. Despite being of another species, he found himself attracted to her, but in view of his recent encounters in Mogad City and Moochar Starport, he felt wary. He also had things to do before he would be free to socialize. The felinoid handed him a small white card. Fromway paused and looked at his watch. “It’s two hours after midday, local time,” she said. “And we run a standard twenty-four hour day here. But a lot of folk just make up their own day and night schedule as it suits them. The felinoid’s desk-phone beeped. “Call me at eight if you want to come to that restaurant,” she said, picking up the phone and answering it. After he’d worked out his schedule of visits and duties, Fromway took out the little white card the felinoid had given him. Sulan – a one-word name printed in black capitals above a twelve-digit number. Fromway gazed at the card for a while then put it back in his pocket and got up from the bench, heading in the direction of a shopping parade displayed in his Gap Station guide.